Performing complete Pulmonary Function Testing (PFT) is a great way to increase revenue for your office. It’s also a great service to your patients. If the patient is new to you – complete PFT gives a more comprehensive picture of their respiratory status. If already diagnosed – annual, bi-annual, and post-exacerbation periods help in their disease management. In addition, on a practical level – they won’t need to schedule another appointment at another location. With Spirometry (Forced Vital Capacity) and Single-Breath Diffusion Testing (DLCO) performed similarly by different devices, the lung volume measurement (LVM) of the MiniBox+ PFT device sets us apart. It’s designed for all patient types and disease status. There is no need for patients to climb into a body plethysmography cabin and/or breathe dry gas for several minutes, as in nitrogen washout. With the MiniBox+, performing and collecting LVM is much easier for both patients and technicians, since there’s no panting against a closed shutter as in body plethysmography. 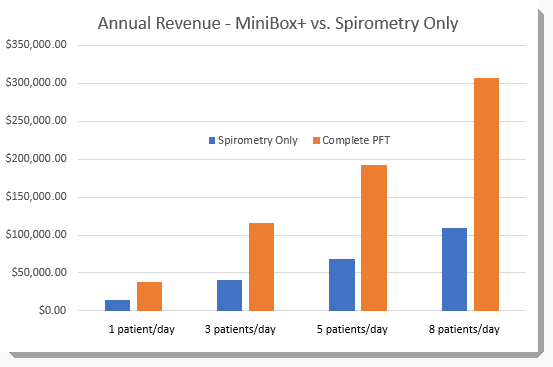 If your technologists can get good spirometry efforts, they will be able to coach lung volume and diffusion efforts with the MiniBox+ and only add about several minutes to your testing workflow of pre/post spirometry. Our innovative method requires only resting tidal breathing for ~6-10 breaths followed by a slow vital capacity maneuver. The entire effort takes approximately 90 seconds. During the tidal breathing portion, we interrupt the inspiration with a 100-msec shutter closure to measure mouth pressure and its effect on our internal 15-liter box. A data model algorithm is used to determine Thoracic Gas Volume (TGV). Once the slow vital capacity is completed, the MiniBox+ has all the lung sub-volumes measured: TLC, VC, IC, FRC, ERV, and RV. At significantly less cost than a body plethysmograph and requiring much less space, the MiniBox+ is an ideal pulmonary function machine for clinics and hospitals. Based on the CMS 2018 Fee Schedule, measuring complete PFT (Pre/Post spirometry, Lung Volumes, and DLCO) for three patients a day would cover the device cost in only 4 months. Over the course of a year, this would generate ~$130,000 in revenue. This calculates to a 214% return on investment in a single year, including the cost of disposables. 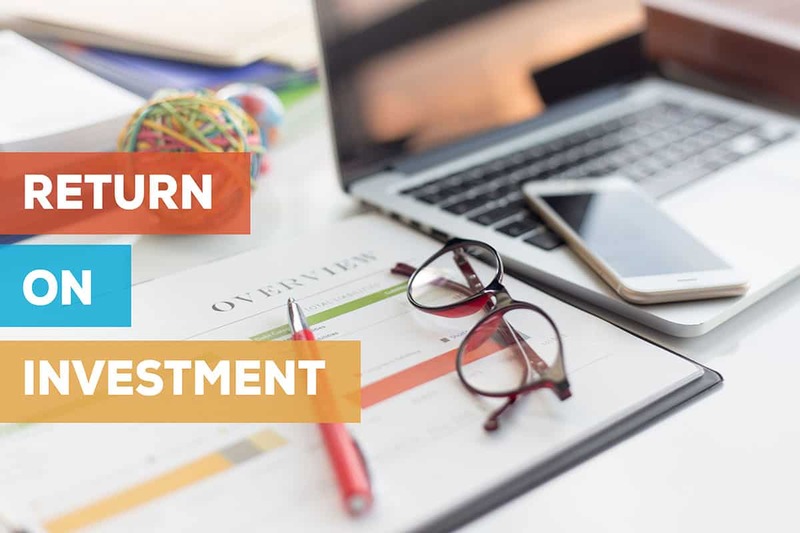 Not only can you provide additional testing services for your patients, you can also significantly increase revenue for your business or hospital. If your patient volume is such that you can test 8 patients a day, $1.6 million can be generated in 5 years. The MiniBox+ comes with a 1 year warranty. With PulmOne’s “buy 3 years of extended warranty, get the 4th year free” offer (a 25% savings), this will give you 5 years of worry-free coverage. Don’t hesitate – start generating revenue and providing the testing and care your patients deserve.